The Azienda Agricola Mario Gagliasso is located in the town of La Morra, south of Piedmont, in the province of Cuneo, in the Langhe area. The winery offers one of the most beautiful views over the Langhe area. La Morra is located at 513 meters above sea-level, 13 km from Alba, on the top of an imposing hill with the Alps and the Monviso as a background. The hill is planted with vines, for ming huge waves and creating an amphitheatre of rare beauty. Luca Gagliasso’s family has a long history of winemaking. Luca's grandfather began 50 years ago, at which time he bottled the first Barolo from their historic vineyard, Rocche dell'Annunziata. Around 1987, Lucas's father took over the family tradition of producing wine and brought forth a few changes: he started by using barriques from France, together with large barrels and temperature controlled steel vats. He also purchased a new vineyard. Luca began working with his father during the 2000 vintage, only part time for the first 3 years. He also worked for 3 years with their wine consultant in an analysis laboratory, and worked as a consultant for other wineries. Luca now works alongside his father, mother, and sister on their 12 hectares of vineyards. 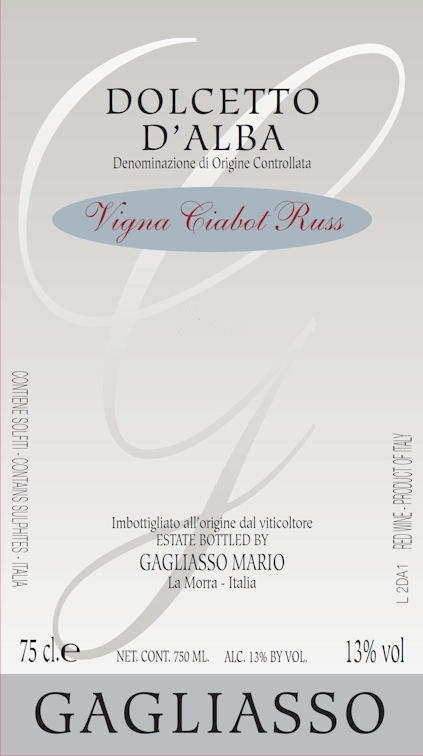 On the weekends, Luca's sister and mother work in their restaurant as cooks – only the Gagliasso wines are served. They are currently extending their facility and in the future they plan to incorporate some guest rooms to the restaurant.